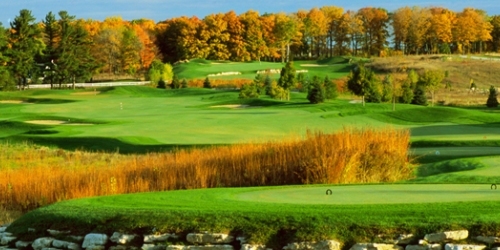 Experience Horseshoe Bay Golf Club through benefits of one of our Door County Hotel Partners. Golf is $99 per player plus cart and each guest may play up to 3 times per season. Share in the private club experience while you stay with one of our hotel partners during your Door County stay. From the moment you arrive at Horseshoe Bay, you'll be afforded all the benefits of being a Club member for a day. Play a round of golf on one of the top rated private clubs in Wisconsin with a layout that honors the true traditions of the game and Door Peninsula. The 18-hole golf course measures 7101 yards from the championship tees, making the course a tough test of golf. Three additional sets of tees allow golfers of varying skill levels to play the course and still find it a challenge. Our hotel partners are spread throughout the county and each offer a unique experience. When calling 877-599-4653, please mention you saw this golf package on GolfWisconsin.com and mention promo code: GolfWisconsin.com. Horseshoe Bay Golf Club reserves the right to change price and offer at anytime. Prices and offer are subject to change without notice. GolfWisconsin.com is not responsible for errors posted in this golf package.